This is our community recipe of the week! In need of cooking inspiration? Look no further! Our inventive community creates fablous recipes, and we choose the best one each week to cook, photograph, and publish for the world to taste. If you’d like your own recipe to be featured, send it to community@kitchenstories.com! Our community member Lucy Reim shared her recipe for Parmesan-thyme shortbread with us and she also loves to bake them for a movie night. However, this Parmesan snack didn't survive that long when we baked it in the office—the whole team snatched nearly all of them still warm, directly from the baking sheet. For these crunchy crackers, you only need 5 ingredients : butter, Parmesan cheese, flour, starch, and thyme. To make the dough, you simply combine all the ingredients and let them rest in the fridge. Afterwards, roll out the dough and cut out circles or squares of your desired size. Into the oven, they go—it doesn't get much easier than that, right? In the very unlikely case that you should have leftovers, you can store them in a resealable bag or an airtight container at room temperature for several days. 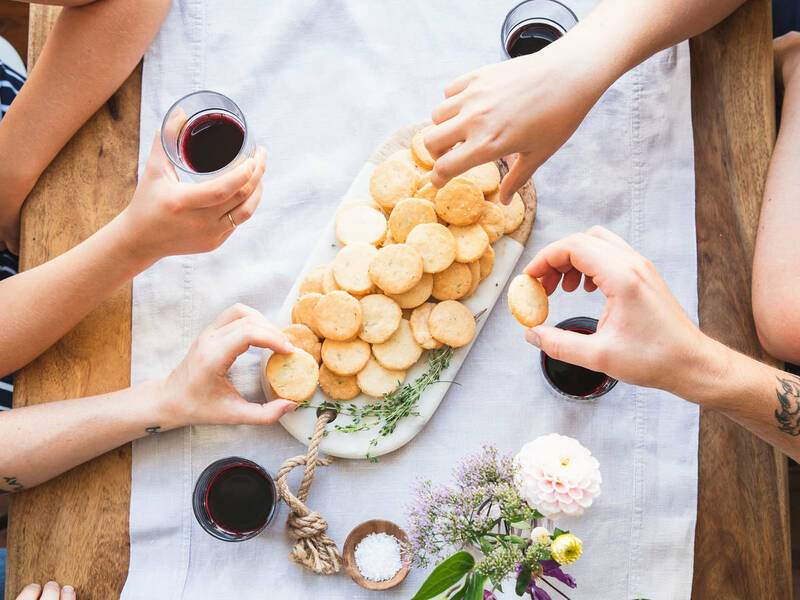 What we particularly love about this recipe is that the shortbread can be enjoyed both cold and warm alike, so you can serve it in various ways—as a finger food for a cozy evening with friends or as a crispy topping for salads. The herbs: You're not the biggest fan of thyme? Simply replace it with another herb like rosemary—which also pairs wonderful with Parmesan cheese. If you don't have any fresh herbs on hand, you can also use dried herbs, just be aware that dried herbs are much stronger in flavor so you won't need to use nearly as much. Do not skip or skimp on the cooling time: Even though the dough only needs to be refrigerated for 30 minutes, you shouldn't skip this step. Refrigerating the dough ensures that the shortbread won't spread in the oven instead take on it's perfect crumbly texture instead. Be prepared and relaxed: To save yourself some stress on an impromptu movie night, you can make the dough up to 1 day in advance. The easiest way to store it is to roll the dough into a thick log, wrap it in plastic wrap, and refrigerate until needed. You can even slice the dough directly from the log to skip rolling and cutting circles out. Have you got more snack recipes up your sleeve? Why not share them with the Kitchen Stories team and our hungry community! Simply send your recipe to community@kitchenstories.com!